A still from the Stephen Hawking biopic "The Theory of Everything," starring Eddie Redmayne and Felicity Jones. 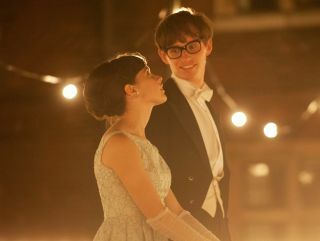 The full-length trailer for the Hawking biopic, called "The Theory of Everything," was unveiled today (Aug. 6). The 2.5-minute trailer suggests that the film, which comes out in November, focuses heavily on the relationship between Stephen Hawking and his first wife Jane, whom he met while a graduate student at Cambridge University in England. In early 1963, shortly after their relationship began, Hawking was diagnosed with the motor neurone disease ALS (amyotrophic lateral sclerosis), also known as Lou Gehrig's disease. He was 21 and was given just two years to live. Hawking defied those long odds, of course, going on to become one of the most highly regarded and influential theoretical physicists since Albert Einstein, as well as a prolific and successful science popularizer with many best-selling books to his name. He came up with groundbreaking theories — determining, for example, that black holes emit radiation and finding, with the cosmologist Roger Penrose, that space and time likely began at the Big Bang and end inside black holes — all while the disease robbed him of his mobility and, eventually, his speech. Today, at the age of 72, Hawking is confined to a wheelchair and relies on a computerized speech-generation system to communicate. But he continues to conduct research and give talks about his work. "The Theory of Everything" stars Eddie Redmayne and Felicity Jones and is directed by James Marsh, who won an Oscar in 2009 for the documentary "Man on Wire." The film is based on Jane Hawking's 2007 memoir, "Travelling to Infinity: My Life with Stephen." "The Theory of Everything" comes out in the United States on Nov. 7 — interestingly, the same day that Christopher Nolan's highly anticipated feature "Interstellar" hits theaters.